Lighting is just as important for fish as for most other animals. This means that fish should have appropriate light, of appropriate intensity for an appropriate amount of time. The most common method of measuring light in an aquarium is by adding up total wattage of bulbs used and dividing that by the volume of the water, in US gallons. The 1-2 wpg rule of thumb was based on the old T12 lights. Now, the thinner and more efficient T5 and T8 fluorescent tubes are used for most home aquairia. So for modern fluorescent lights in aquariums under 60 cm tall, around 1 wpg is best for the average, undemanding plants, combined with average water changes and average stocking, although it is not uncommon to find anything from 0.5 wpg, in low-plant aquariums, up to 2 wpg, in “high-tech” (meaning fertiliser and CO2 addition to encourage plant growth and prevent algae). I find that generic tri-phosphor fluorescent tubes work just as well as “aquarium” tubes, even for plants, so I will normally buy those to replace old tubes over planted aquaria and I use old tubes from planted aquaria in plant-free setups until the tubes break. LED lights are also increasing in popularity now and compact fluorescent bulbs are a popular choice for DIY units. There are few problems associated with low light, with the exception of poor plant growth. On the other hand, high levels of light, long photoperiods, multiple lighting periods per day and photoperiods of varying length encourage algae growth, which can become a long term problem. A timer and a photoperiod of 6-10 hours per day usually go a long way to preventing potential problems. Another point to consider is that some fish require light to be not too bright, or they will feel uncomfortable. In these cases, it is best to provide floating plants, which will cut down on the amount of light entering the water and will give the fish places to hide, thus making them feel more comfortable. I normally use mechanical timers because they are reliable enough and cheaper than digital timers, but this time, I found a digital timer which was only 2 EUR more than a small mechanical timer with half hour intervals and half the size of a mechanical timers with quarter hour intervals, so it was an easy decision. The light which was included in the set came is a 24 watt compact fluorescent (also known as a power compact) bulb, referred to as “Plant Pro” by Arcadia. Given that the aquarium will hold about 16 gallons, that gives me approximately 1.5 wpg. It is more than I’m used to, but I have occasionally had success with that much light without addition of fertiliser and CO2. Since this will be a tropical aquarium, it will require heating. Fish are poikilotherms, so (in rather crude terms), their environment affects their metabolism. Because fish are not able to regulate their own body temperature, the temperature of the water will affect their enzyme activity, so it is important that an appropriate water temperature, which is sustainable in the long term, is chosen for the fish to live in. This also means that temperature will affect the lifespan and activity level of the fish: for the same fish, a higher water temperature would mean more active fish with shorter life span, while a lower temperature would result in lower level of activity, but with a longer lifespan. Changes in temperature throughout the year or during a rainy season can also be a breeding trigger for some species of fish. The latter can easily be simulated by large water changes with cool or cold water. Seasons of the year are more difficult, although still possible by setting the heater to a lower temperature in winter and increasing it toward summer, then lowering it again for the winter. There are, of course, plenty of fish which overlap two (or all) of these groups, or are even outside those temperature ranges altogether. Since there are almost no species of fish, available within the aquarium trade in Europe, which fit into either of the first two categories and a 60 litre aquarium, I have settled on tropical fish. In an average European household, approximately 1 watt of heater per litre of aquarium water (rounded up, as needed) is enough to keep the water up to temperature when the temperature drops inside the house in winter. Because this is a small aquarium, I will be using the 50 W heater which was included in the set. For aquariums over 100 cm in length, I normally prefer to use more than one heater to make sure that the temperature is the same throughout. Most heaters have inbuilt thermostats, so it should not matter if the chosen heater gives more than 1 watt per litre of water, but when a heater breaks, it is most often in the “on” state, which means that the heater does not switch off when the water is warm enough. Because of this, I prefer to use appropriately rated heaters, so it is more likely that I will have time to notice the problem, before the fish come to harm. Internal heaters are usually made out of glass (sometimes with a removable plastic cage around them), polymers and metal. The most common heater are made of glass, but these can be cracked easily, so one has to be careful about letting them cool down properly before taking them out of water and large fish can break them. Polymer heaters are considerably more difficult to break, but are slightly more expensive and difficult to manufacture. Metal heaters are uncommon. Another common problem with internal heaters is that the numbers on the temperature dial (or a separate scale on the heater itself) do not correspond to the temperature that the heater will be heating to, because these can easily become displaced. This is not a problem, as long as you know how high the displacement is. On top of the standard internal heaters, one can now buy in-line heaters for external filters, external filter with heaters built into them and undergravel heaters.. but all of these are currently less common and none are suitable for the set-up which I am planning. In addition to the heater, I will also buy a glass thermometer. I’m going away for two weeks and leaving a friend to look after my fish. She is not a fishkeeper, so I am going down the usual “pre-bag the food” route. The main reason she is coming round is to actually top up the marine aquarium and water the plants, so feeding the fish in the display aquarium and water changes are a bonus. The Ludwiga brevipes has been growing fuller of hair algae and loosing its leaves, so I have pulled it out for the moment and am trying to perform a blackout on it, in the hope that the algae would die back before the plant. During the more major weekly maintenance, I performed a 10% water change and tidied plants. Water readings were nitrate at 15 ppm, pH 7.4, 20 °GH, 3 °KH. Filters are essential to modern fish keeping: they are home to bacteria which make the water safe for the fish. The nitrogen cycle in an aquarium commences at the point where fish and dead plant matter produce ammonia. Some of the ammonia is then used up by plants, but the majority is converted, by bacteria which live in the filter, into nitrite. Nitrite is then converted by filter bacteria into nitrate. Some nitrate is used up by plants and the rest is removed during water changes. The general format of a filter is some sort of pump which causes water to move through some media. This is usually in the form of an internal filter, an external filter, an air pump powered sponge filter, an undergravel filter, a sump, a trickle filter, a hang-on-the-back filter, and so on. For this aquarium, I will be using an internal filter, potentially moving onto an external later on. This media includes various sponges, wool and floss, it physically removes dirt from the aquarium by not letting it pass through the filter. The primary function of this media is to adsorb undesirable certain molecules out of the water: for example, activated carbon can be used to remove the remainder of medication after a completed treatment. Some “chemical media” works on the basis of ion exchange. It should usually not be used on an every day basis. Bio-media is the best media for the bacteria to live on because it is usually very porous, so has a high surface area. It is usually made out of some sort of ceramic material. In an undergravel filter, the bio-media is the gravel and in a sponge filter, it is the sponge. The bacteria are not particularly picky, so will actually live on any surface they can, regardless of the type of media used. The first step for setting up the aquarium will be cultivating these filter bacteria. They are present in tap water in very small numbers, so I will be feeding them ammonia to encourage the colony to grow. Once the colony is large enough to support fish life, I will be replacing the ammonia with fish (who naturally produce ammonia). The filter which came with the kit is a Powerbio 700 by Classica (which is the Arcadia brand for non-lighting equipment). 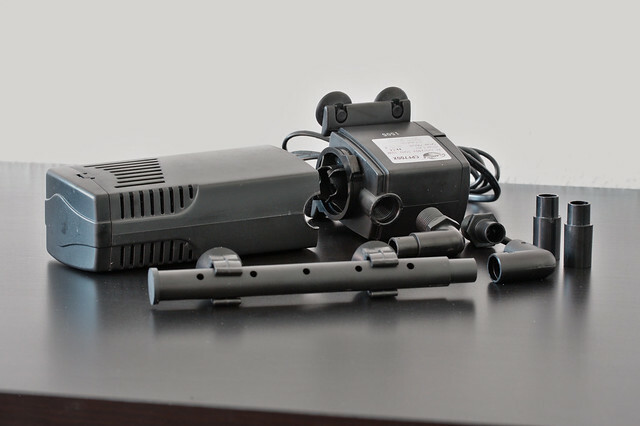 It consists of a standard filter power head with a screw-on spray bar attachment, on top of a filter media housing which contains a cage for loose media (containing carbon) and a rough black sponge (not carbon). The carbon has already been taken out and I will be replacing it with some form of bio-media. I will keep the carbon in case I ever need to remove medication after treatments. This log is about a pretty standard 60 litre aquarium (which is approximately 16 US gallons or 13 imperial gallons). It is a standard shape: 60 cm long, by 30 cm deep, by 36 cm high (which is approximately 24 × 12 × 14 inches). For the purpose of setting up and running an aquarium, the specific manufacturer of the glass doesn’t matter. The three most common materials used for aquaria are glass, plastic and acrylic. I prefer glass because it does not scratch as easily as cheap plastic aquaria and acrylic is used predominantly for oddly shaped or large aquaria. 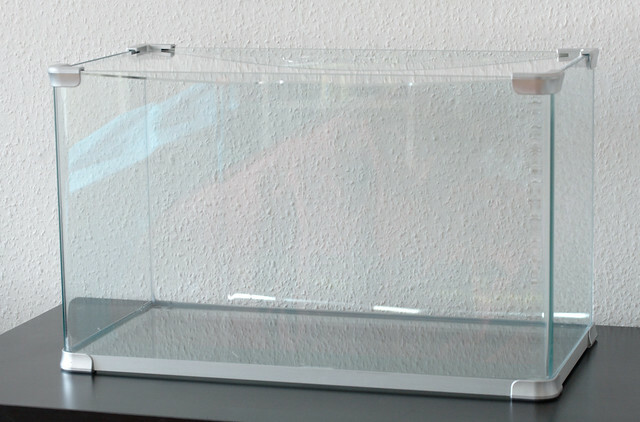 For simplicity and because I prefer aquariums with a flat front and curved corners, I decided to go for the Arc Tank II kit by Arcadia. It is an all-in-one package which contains most of the equipment needed to start. The glass is 5 mm thick, with a slight green tinge. The silicone is clear, and the joints are quite neat, so it is barely visible. The surround on the bottom is a thin and made of metallic grey plastic. The aquarium itself is suspended on the frame, about 3 mm from the surface, with all the weight being spread between the four corners. The cover glass is 3 mm acrylic, with a large cut-out for the light fitting on the back a smaller cut-out for feeding on the front. Due to the thinness of the acrylic, it does sag in the centre. The cover glass is quite loose and is very light, so if one is planning to keep fish which are known for attempts to get out, a new cover glass will be required. Because the aquarium is suspended on a frame, a base mat should not be used. For the same reason, whatever is used for the aquarium stand should provide good support in the corners as it will weigh 70-80 kg when full of water and decor. Overall, it is nicer than the average aquarium with a lid and looks neat. 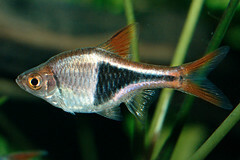 Seven new harlequin rasboras added.. although they are small and young, so look slightly like espei rasboras. Acclimatisation is done using the drip method: add fish and shop water to a bucket; over a few hours, drain water from your aquarium into the bucket; once the bucket is full, net out the fish into the your aquarium. So today is a “large” water change day, with a 10-15% water change. I was planning to clean the filter (Eheim 2076) as well, but I have found that there is the same problem with this one that I had with one at work last week: the “floater complete” (part number 7428728) can become dislodged during re-assembly, after cleaning, which allows the middle part of the three which make up “floater complete” to move up into the “adaptor complete” (aka the tap for the hoses, part number 7428718), which means that it is becomes impossible to turn off the tap because the little white tube blocks the part where it closes off. Who comes up with these part names? The symptoms of the problem are inability to close the tap (feels like it is stuck) and if you push it a bit too hard, the tap will easily move from “on” to “off” and back, but without any effect (while making clicky noises in one direction- yes, you have snapped it). The solution is either to take the whole pump to an Eheim repair centre (if it is under warranty, it took them 24 hours to fix, they also did a 6 hour service on it and flashed the firmware, while they were at it) or use a Torx T9 screwdriver to pull apart the filter and fix it yourself (which will probably void any warranty you may have). If you attempt to fix it yourself, you will get water everywhere, so be careful with the power sockets which your filter is probably plugged into and which are right next to it, on the ground. You will need to lift the inlet and outlet tubes out of the tank, then drain them by undoing the clips, separating the pump assembly from the canister and letting the water drain over the sides onto strategically placed towels. Next step is to pull the pump assembly apart and remove the offending part, reassembly should be quite easy. Photos to follow when I actually go through with this! Why manufacturing defect? Because this has happened on both of my 2076 filters, within a week of each other. Yes, I am quite careful about reassembling everything properly. Luckily, the filters only need cleaning once every few months, so it’s usually fine to take one’s time over getting it fixed. It is still an excellent filter, even with this flaw.. but it is an important flaw to be aware of, so one does not break it accidentally. Oh yes, and lighting is now on from 11:00 until 21:00. As the other two pairs of rams are still looking to spawn, I have tidied the plants, probably disrupting the process, while I was at it. The tank is still on a 4-5% daily water change. I have not been using dechlorinator because anything in the tap water would instantly be diluted by 20 times. I have also added some Indian almond leaves to add a black water effect and a couple new pieces of oak. The plecos have made a good job of munching through it, especially the rusty pleco (Hypostomus cochliodon), who are one of the “true” wood eaters. The Amazon sword (Echinodorus bleheri) has moved forward, so it is now more visible. I am also trying to grow a few cuttings, towards the front of the tank. The first pair has spawned! They have, as before, chosen the Anubias barteri leaves as their spawning site, one which is out of the way so the other fish will not find it by accident. The other two females are still full of eggs and with their papilla (tubes through which the eggs are laid) down, but not spawning yet. Water parameters are 25° C, pH 7.6, GH 20°, KH 3° and nitrate 20 ppm.